Installing A Sump Pump: DIY Steps. Toronto Residents, You Get A Rebate! Installing A Sump Pump: DIY steps. Toronto Residents, Get A Rebate! Installing a sump pump in your basement or crawl space could be the best proactive solution for wet or occasionally flooded basement. It can be a do-it-yourself project for a handy individual. However, if you want to do it yourself, you need to be sure that this is legal in your area. 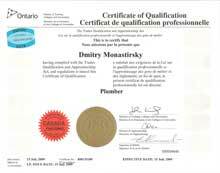 Some cities, city of Toronto included, require that a certified plumber does this job. Otherwise, if something happens to your home, insurance company may decline your claim and you alone will be liable. If you are in Toronto, though, you don't need to worry. You can leave sump pump install to a professional and receive the rebate from the city. Call us for sump pumps installation and ask us about Toronto city rebate program. We will gladly answer your questions about procedure and prices for sump pump install. For DIY-ers, please read the manual, instructions, and follow the steps in the manual that comes with your sump pump. Our article doesn't replace not supplement the manual, it's a high level list to help you understand what's invlolved in sump pump install. You will be digging a sump pit, so it's crusial to find out where your sewer, water and other utility lines enter your home. Damage to them could be hazardous to you and your home. Try to position a sump pit at the lowest point of your basement, still reasonable close to the electrical outlet and an exterior wall. Ensure you have GFCI protected outlet; plan to replace the ordinary one with GFCI. Determine where the discharge pipe is going to run out of your basement. Decide how you are going to route the pipe from the pump to the outside of your house. Purchase your sump pump and liner before you move on. The sump liner is a plastic tub with holes in the sides so water can seep in. It will act as a template for the hole you will be making in your basement floor. Purchase or rent tools. You will need a jackhammer to drill holes in the cement floor. Using a jackhammer cut around the marked outline from the inside and break up the concrete into chunks tat you could easily dispose of. Dig the hole for the pit. Its depth is usually recommended by the sump pump manufacturer. Put the liner in place and ensure it fits. Seal around the edges of the liner with concrete and trowel it level with the floor. Attach the discharge pipe to the sump pump and set the pump into the pit. Use PVC piping to plumb the sump pump. You will need to drill the hole to get the pipe outside. Install check valve to prevent damage to your sump pump by the water that rushes back into it from the pipe once the sump pump shuts off. PVC glue and plumber's tape are to be used for PVC piping and the adapter between sump pump and piping. On the outside, caulk and seal around the discharge pipe and attach a pipe to run the water at last 6 feet away from your foundation. Use a diverter to direct the water well away from your house. Adjust the float valve (as per manufacturer directions), plug in the pump and pour in 5 or 10 gallons of water into sump pit to check the pump's operation. We purposefully left out installing pedestal sump pumps, because our recommended configuration includes battery backup for the cases when power goes out. It works only with with submersible sump pumps. Power may go out during the storm, exactly when your home is most prone to flooding. When it's wise to use plumber's services? 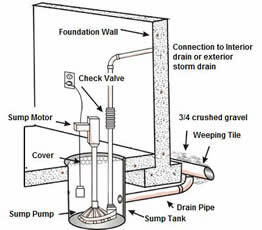 As you can see from this high level list of steps, installing a sump pump includes work with cement and pipes: fitting them, drilling holes, installing check valve an so on. Word of warning, mistakes are unavoidable. Just check Internet DIY forums and you will see people failing on literally every step of this process. Moreover, when sump pump fails (which may happen to even the best installations) and basement floods, your spouse is blaming you, not the plumber, for spending family's vacation fund on the cleanup of the wet basement. Using City of Toronto rebate, you can avoid wasting your time ( and money for renting or buying tools) and get an installed, ready to go, high quality sump pump for under $500. Is it worth the investment? Consider the cost of drying your flooded basement, mold remediation, new flooring, new furniture, irreversible damage to things you love. Add sump pump repair or new install. Consider all the commotion and your precious time that will go into this rather urgent cleanup and renovation process (because you cannot let your basement sit flooded for weeks). Note that even thought we are 24x7 plumbers, we would hate to receive a call in the middle of the night and learn that our sump pump failed. We value our clients. We are proud to say that we never did get that call from customers who chose our recommended configuration and let us do the install. On the contrary, we have received calls from customers thanking us for choosing the right configuration for them, because the power did go out when the rain was pouring, and the sump pump just kept pumping. We hope you will give us a chance to protect your home. Give us a call and receive a free estimate and a free home plumbing inspection as a bonus.